Home Sweet Michigan began in 2012 and has turned into an exciting full time business for Heather Osborn along with 3 part time employees. 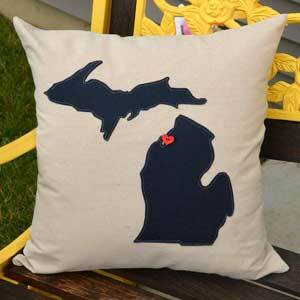 These handmade pillows represent our great state of Michigan in a variety of ways. 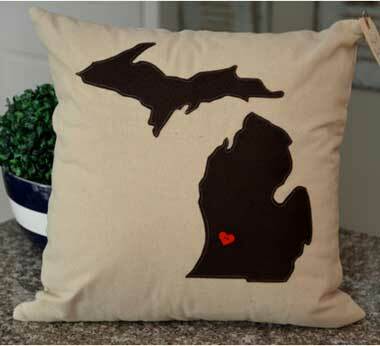 Heather takes pride in the quality of her products as each pillow is hand crafted and created with love in her Mattawan, Michigan studio. Each piece is hand cut, applied with interfacing and then machine stitched around the edges. A red wooden heart button is then sewn on the location of your choice. Service is her number one priority and she deeply values her relationship with our customers. She also takes pride in the short turn around time. Heather knows when you purchase a product that you are excited to receive it and she wants to get it to you as soon as she can! 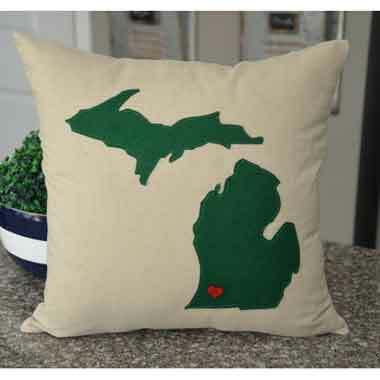 These Michigan pillows make great gifts for Christmas, weddings, birthdays, graduation, moving gift, house warming, cabins or cottage. 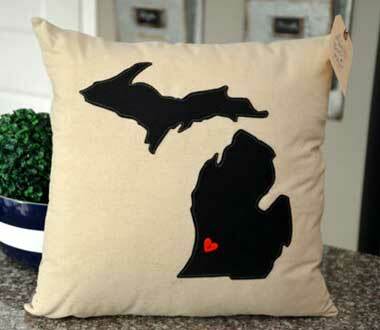 Happy pillow shopping! !